Ordered a tire for project BajAAB to check fit. Now that it’s here, I check the website and there are none left. Anywhere. I need three more. It’s a Federal Couragia 195/80 R15. 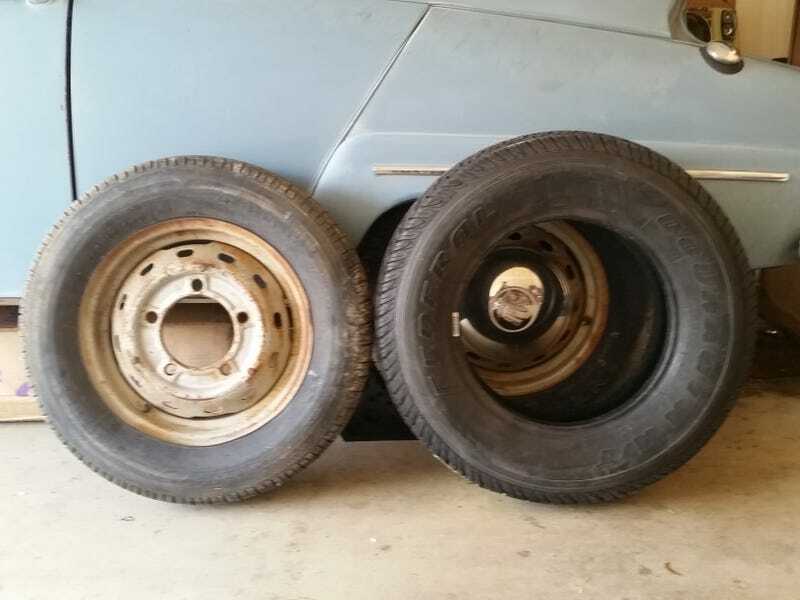 There’s no space for anything wider on this car, and it’s a tough size to find tires in. The good news is this tire is 2" larger in diameter than the 165 R15 tires on it now, so should give around 1" more clearance, bringing the car up to 8.5" road clearance empty, and a minimum clearance (riding on bumpstops) of 5.5" which is really not so bad for a car with stock suspension (it will give about 12.5” of clearance under the rear axle). Unfortunately, even 195 is a little too wide at full lock with the stock wheels, so I’ll be swapping out the steelies for the sonett alloys on my 95, which give 1/4" more clearance. Or find some spacers, if such things exist in the Saab’s bolt pattern. Ideally I’d have the steel wheels re-barrelled with wider rims and different backspacing, but I ain’t got time or money for that right now.